BOSTON SOCIALISM: 4/13, Don't Bomb Syria! Let the refugees in! 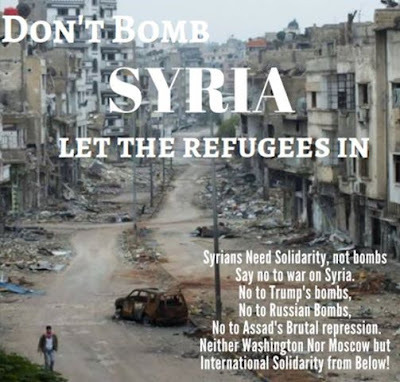 4/13, Don't Bomb Syria! Let the refugees in! The Trump administration recently ordered missile strikes in Syria, escalating previous U.S. military actions in the country. This adds to the bloodbath already raining down on the Syrian people by Syrian President Bashar al Assad allied with Russian military forces. All this is punishment for the revolutionary uprising by the Syrian people who have been repressed by Assad. Join this important discussion on how we need to mobilize against this latest atrocity by Trump, and oppose U.S and Russian imperialism and defend the Syrian revolution from Assad.